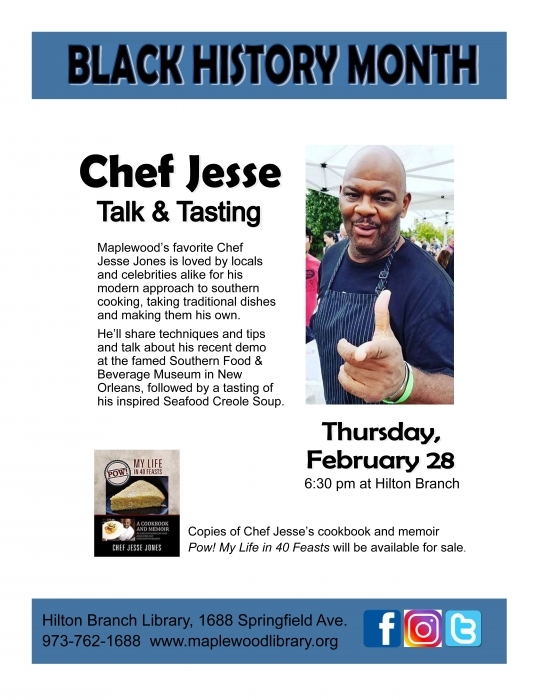 Thursday, February 28 6:30 pm at Hilton Branch Maplewood’s favorite Chef Jesse Jones is loved by locals and celebrities alike for his modern approach to southern cooking, taking traditional dishes and making them his own. He’ll share techniques and tips and talk about his recent demo at the famed Southern Food & Beverage Museum in New Orleans, followed by a tasting of his inspired Seafood Creole Soup. Copies of Chef Jesse’s cookbook and memoir Pow! My Life in 40 Feasts will be available for sale.